Perugia City of Umbria, provincial and regional capital. 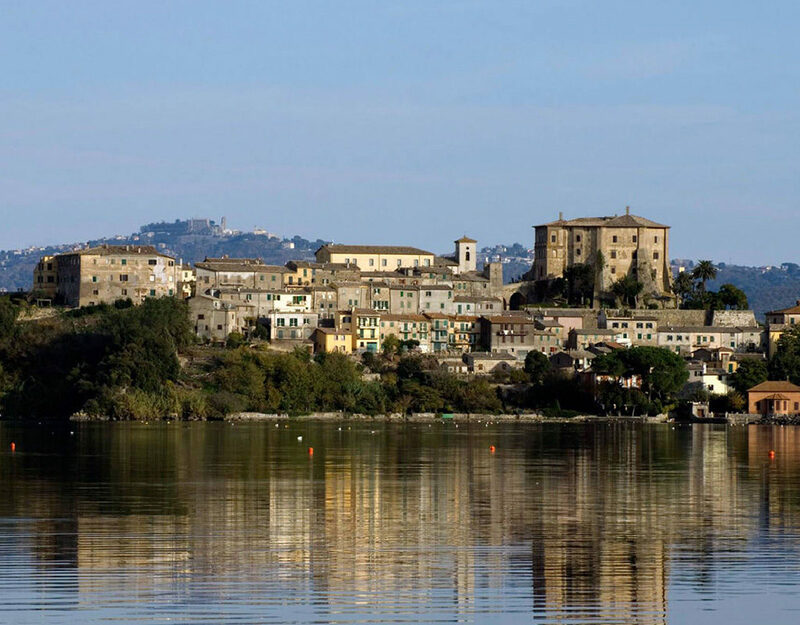 Founded by the Umbrian or by Auleste, it was one of the main Etruscan cities (5th-4th century BC). Faithful to Rome in the Hannibal war, it was a town hall after the social war. In 41-40 BC Octavian besieged Lucio Antonio; became emperor, he rebuilt it. Probably Treboniano Gallo (251-253) erected it as a colony. In the High Middle Ages Perugia was long under the rule of the Byzantines, interrupted (547-548) by the occupation of the goths of Totila and the Longobard, under which it was the center of a duchy until the 6th century. In the 8th century Perugia remained under the Byzantine influence, then passing into the papal orbit. In the investiture struggle, he was equidistant between pope and emperor. He obtained (1186) from Henry VI emperor the confirmation of the municipality and of the possession of the surrounding territory; then, the acquisition of Assisi (1194) and other lands also found sanction in papal recognition (1198). From Innocent III onwards, relations between Perugia and Rome became more firm. The internal struggles between Guelphs (Raspanti) and Ghibellines (Beccherini) lasted until 1393, when it passed, with Biordo Michelotti, to the aristocratic regime. Perugia was then of Gian Galeazzo Visconti (1400), lordship of Ladislao of Durazzo (1408-14), dominion of Braccio Fortebracci (1416-24). Then it belonged to the Baglioni, who were in a fierce struggle with the Oddi (1488, 1491, 1495) and took back power, after the adventure of the duke Valentino (1503), with Gian Paolo. 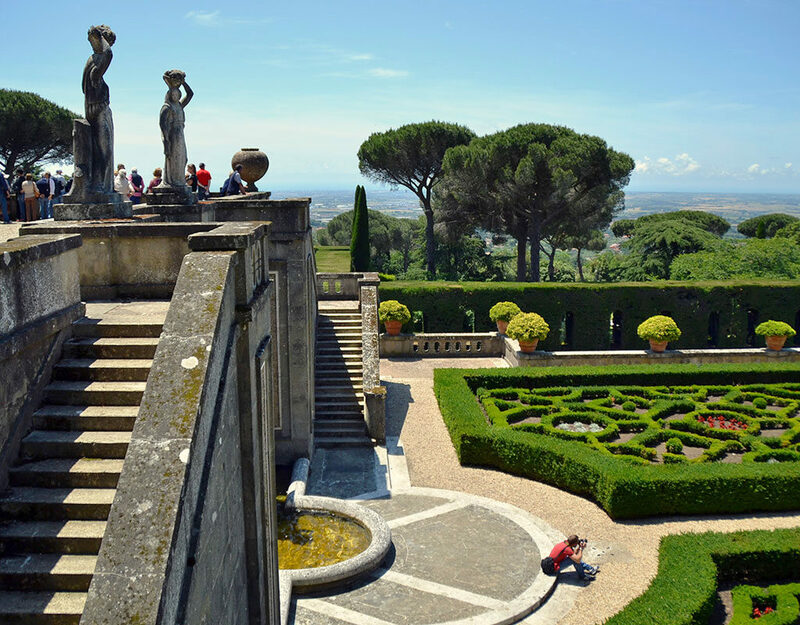 The lordship of the Baglioni family ended in 1540, when Paul III began the construction of the Pauline fortress, to safeguard the rights of the Church. The city, which in 1859 rebelled against the papal dominion, welcomed the Piedmontese troops in 1860. 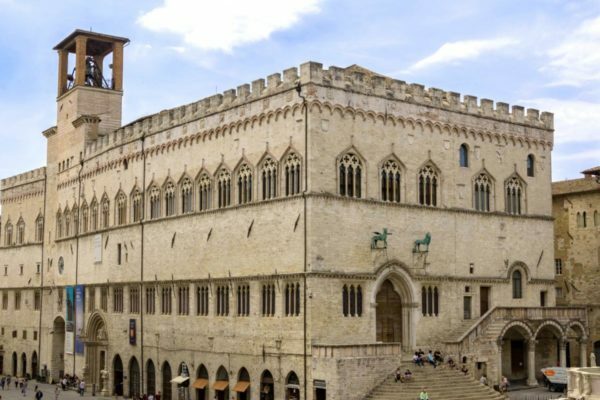 Perugia, in addition to a large artistic heritage offers events and events of international renown, including Eurochocolate in the fall and Umbria Jazz. The latter is held every year in mid-July. From small clubs, theaters, streets and squares, the whole historic center lives in the days of Umbria Jazz in a magical and electrifying atmosphere where music blends with the history and architecture of the city. But Perugia as well as being a magnificent medieval village has always been an innovative city. 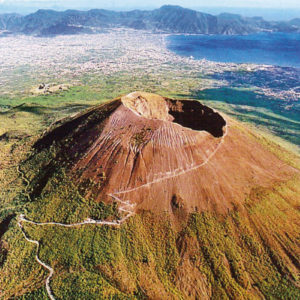 Suffice it to say that it was the first Italian city to build escalators in several points of the city, to reach the center on foot. Perugia is a small jewel that opens up slowly before the eyes of visitors. 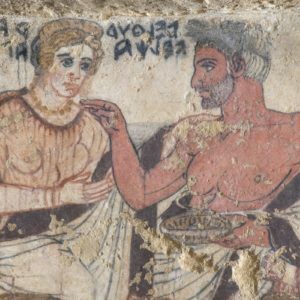 The Umbrian town preserves artistic and monumental treasures that testify its rich past and render justice to the cultural primacy of our country. Although it preserves the appearance and the rhythm of life of a small fortified medieval village, Perugia has a very intense city life, linked above all to the presence of one of the oldest University of the Peninsula (founded in 1308), as well as the greater University for foreigners of Italy. 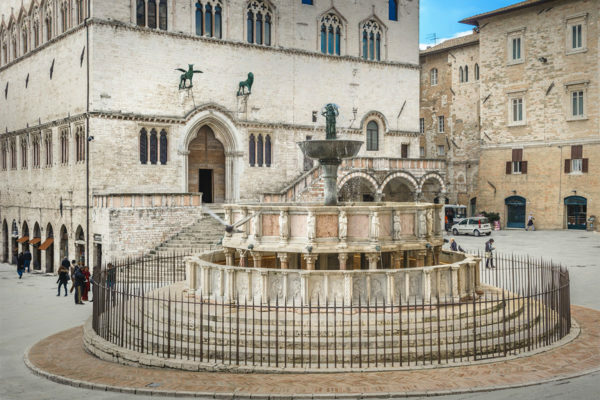 In the center of Piazza IV Novembre stands this splendid fountain, one of the most famous in Italy and symbol of medieval Perugia. The Fontana Maggiore was built between 1275 and 1278, designed by Nicola and Giovanni Pisano, to receive the water coming from the Monte Pacciano Aqueduct. The two artists wanted the fountain on a circular staircase, consisting of two pink and white stone basins, surmounted by a bronze basin. From here sprout three nymphs that support an amphora from which water flows. The upper basin rests on small columns from which stand statues depicting characters related to the mythical foundation of the city; the lower basin, instead, is decorated with fifty panels that depict the calendar of agricultural works, some biblical, historical and mythological episodes, the two symbols of the city (the griffin), the Guelph party (the lion) and the empire (l ‘eagle). The review of the seven liberal arts and philosophy is closed. Singular presence in the panels of two scenes taken from the tales of Aesop (crane and wolf & wolf and lamb). After the last restoration, today it is possible to admire the work in all its original splendor. The works for the construction of the Cathedral dedicated to San Lorenzo, one of the patron saints of the city, began in 1345 and ended in 1490. Both the side wall and the main façade, however, remained incomplete. The side wall faces the fountain Greater, and a geometric pattern of pink and white marble rhombs decorates only the lower side. The main façade, instead, overlooks Piazza Danti and is characterized by a Baroque portal of 1729. The interior, of late Gothic, has three naves of equal height, divided by mighty pillars. The decorations were completed in the eighteenth century and, among them, stand out The Deposition by Federico Barocci, the sixteenth century polychrome stained glass by Arrigo Fiammingo and the Funeral Monument in honor of the bishop Andrea Baglioni created by Urbano da Cortona. In the cloister of the Cathedral you can visit the Museo Capitolare, home to important works of art. Along Corso Vannucci, at the last floors of the Palazzo dei Priori, the National Gallery of Umbria has its seat since 1878. The Gallery houses one of the most complete and rich artistic heritage of the whole region. The works cover a period from the 13th to the 19th century and are organized according to an exhaustive chronological itinerary: on the third floor are collected works ranging from the 13th to the 15th century; while on the second floor those from the sixteenth to the nineteenth century. 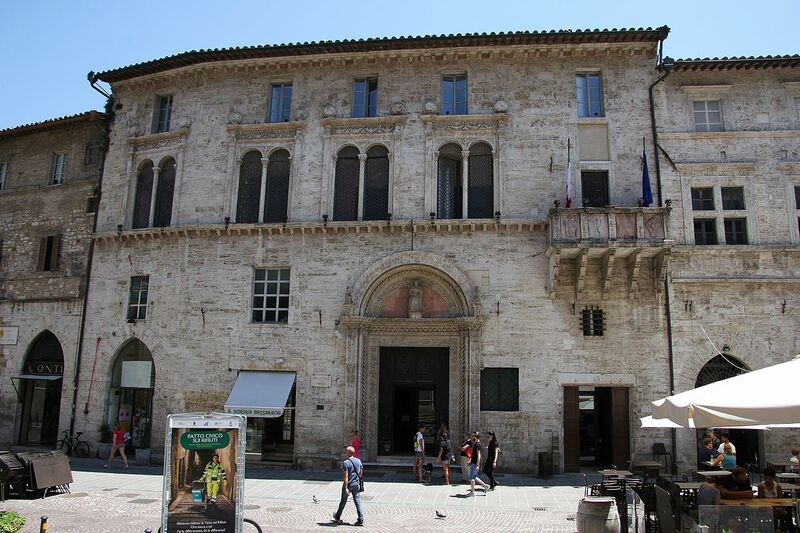 Unlike the other great Italian and foreign museums, in the National Gallery of Umbria the masterpieces are collected in a small space, then follow each other without stopping and you can also see them with a short visit. You can admire in a single glance the madonnas and polyptychs of Florentine and Sienese painting of the 1400s, alongside the masterpieces of the Renaissance, the unique pieces of Umbrian jewelery. Among all, masterpieces of Duccio di Buoninsegna, Piero della Francesca, Beato Angelico, Pinturicchio and Perugino stand out. In addition, monographic collections dedicated to jewelery, ancient graphics, topography and Umbrian fabrics enrich the collection. La Rocca Paolina is praised in a famous poem by Giosuè Carducci, an ancient fortress commissioned by Pope Paolo III and realized by Antonio da Sangallo the Younger. 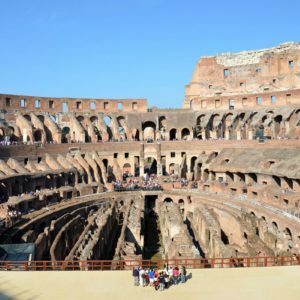 The intent of the Pope, in which the memory of the Sack of Rome was still alive, was to make the city safe and thus to create an efficient refuge as Castel Sant’Angelo had once been. Its construction necessitated the destruction of more than a hundred houses but also of monasteries and churches, above all owned by the Baglioni family, hated by the Pope. La Rocca was a symbol of papal authority until 1860, when it was demolished following the annexation to the Kingdom of Italy. 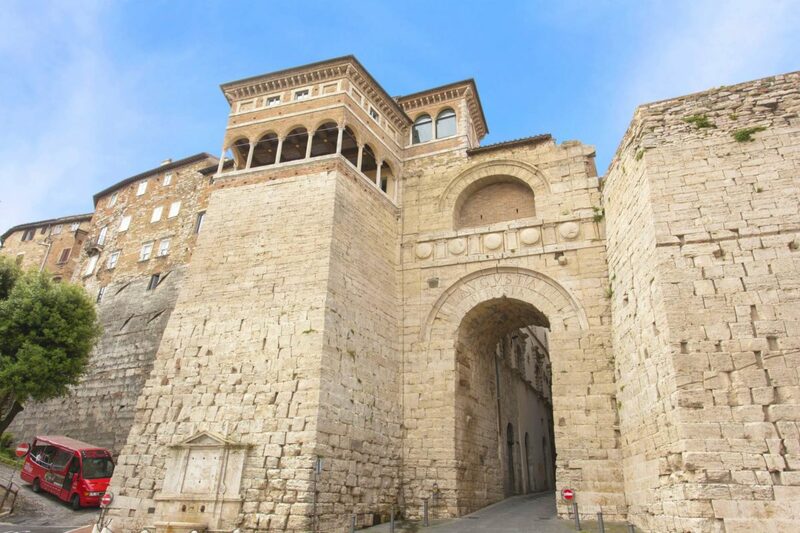 Of that ancient building are visible a part of the retaining walls and the bastion that incorporates Porta Marzia. The most striking part to visit of what remains of the Rocca Paolina is the underground, in particular the escalators that from the Piazza Partigiani parking area pass through the Rocca under the side portico of the Palazzo del Governo (1870, seat of the Province) and arrive in Piazza Italy. In this truly unique and suggestive setting, a kind of city in the city, there are shops, boutiques, bookshops and cultural events are often organized. The Oratory was wanted by the Franciscan friars in honor of San Bernardino da Siena, whose preaching had inflamed the Perugians on several occasions. The splendid polychrome facade is the work of Agostino di Duccio who, using different materials, managed to create a true symphony of colors that explodes in a fascinating game of reflections. In a fine embroidery of stones and marbles, Agostino di Duccio had managed to to glorify Bernardino and to narrate his miracles. The work of Agostino is the most famous Renaissance monument in Perugia. A double portal leads the visitor into the interior from the gothic system, whose altar is made up of a paleocristian sarcophagus of the fourth century that collects the remains of the blessed Egidio, companion of St. Francis. Behind the altar, another portal introduces into the Oratory of Sant’Andrea with a coffered ceiling and paintings from the 18th and 19th centuries.